I was recently working on some character studies geared towards middle grade. The characters were *almost* 12 years old. I’ve mostly worked on younger Picture Book age characters before, so there was some testing to do. In the image below, you will see my three rounds of sketches for the main character. The sketch on the right was the first one. She looks a little too old – about 16. The sketch on the left was my second attempt. She looks a little too young – about 7 years old. The one on the middle was my third attempt. She is just right – *almost* 12. Welcome back to our Mini-Interview Grand Finale Week! Today I have with me the author-illustrator Sophie Blackall. I have lost count of how many times I have read, looked, open and closed “Are You Awake?”. Sophie brilliantly wrote and illustrated it. Since I love the book and Sophie’s work so much, I had to asked her to be my last guest. It’s been a busy couple of months for Sophie, nevertheless she found time for us. With you, the fantastic Sophie Blackall. Born in 1970, Sophie Blackall grew up in Australia. She completed a Bachelor of Design in Sydney in 1992 with honors. Blackall was seduced by New York and moved there in 2000. In 2002, she illustrated the children’s book “Ruby’s Wish” by Shirin Yim Bridges (Chronicle Books), which won the Ezra Jack Keats award in 2003. Since then, she has illustrated seventeen other books for children including “Meet Wild Boars” by Meg Rosoff (Henry Holt & Co) which won the Society of Illustrators Founders Award, and the “Ivy and Bean” series by Annie Barrows (Chronicle Books). It’s time for our Mini-Interview Series Grand Finale! 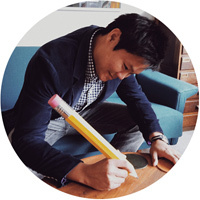 For the past 3 years, we have interviewed Illustrators and Author-Illustrators. It has been a fantastic opportunity while we have shared them with you. We are seeing busier times in our lives these days and are retiring the Mini-Interviews. If you want to revisit them, you can find links to all MIs still available at this Pinterest board. 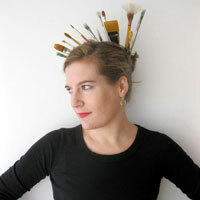 Sophie Blackall talks books here on Tuesday. Loren Long chats with Molly on Wednesday. Antoinette Portis visits Mikela on Thursday. And, Brian Lies is Laura’s guest on Friday. Hello again! Happy Thanksgiving week! Welcome back to week four of our 2013 November Mini-Interviews. People, it’s time to celebrate! I have here with me the most talented Zachariah OHora. The first time I saw Zach’s work I was at a bookstore. I opened “No Fits, Nilson!” and was immediately attracted by the bold work. Nilson, the zen-challenged Gorilla, filled each page. With each page turn, I fell more and more in love with this angry ape. I wanted to know more about the author-illustrator behind the book so I asked Zach to be part of our Mini-Interviews. He graciously agreed. Now, I am giddy to introduce you to Zachariah OHora. Zachariah OHora is an award winning illustrator. His work has appeared in numerous magazines and newspapers and has been recognized by the Society of Illustrators, American Illustration, Communication Arts, AIGA and Print Magazine. His debut book “Stop Snoring Bernard!” (Henry Holt) was the PA One Book choice for 2012 and won the Society of Illustrators Founders Award for 2011. His latest book “No Fits Nilson!” (Dial) received a Kirkus Star and was included in the 2013 SOI Original Art Show. He is hard at work on his next picture book “My Cousin Momo” (Winter 2015) about a flying squirrel who is reluctant to show off his talent. He is also illustrating two books for Little, Brown –“Wolfie the Bunny” and “Horrible Bear” both written by Ame Dyckman. Welcome to our third week of the 2013 November Mini-Interviews. This week, I have invited an author-illustrator whose work I love. The most wonderful Brian Won. I saw Brian’s work for the first time at Lost Weekend 2012. Brian was a Mentee from the 2012 SCBWI Los Angeles Conference. I immediately connected with his work. It was moving, full of emotion, and full of heart. The details, textures and subject matter were fantastic. I had to have some time to ask him some questions about his Author-Illlustration career, and so, I asked him to be a guest of our Mini-Interviews. To my pleasure, he agreed. With you, the fantastic Brian Won. 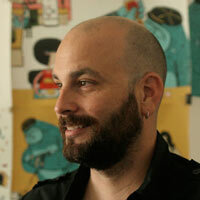 Brian Won is an illustrator, children’s book author, and motion graphics designer. He wears many hats. After graduating from Art Center College of Design with an illustration degree, he studied graphic design, and co–founded a motion graphics company, National Television. During his 12 years in the motion design industry, his roles have varied from Creative Director, Art Director, Illustrator, and Designer. He is also a father of a three year old boy and coincidentally, wrote and illustrated a children’s book entitled “Hooray for Hat!” coming out in Spring 2014. Hello again! Welcome to our second week of the 2013 November Mini-Interviews. This week, I have the huge pleasure to bring you the most wonderful author-illustrator, Yuyi Morales. I am fascinated with Yuyi’s work. Completely. Utterly. Needless to say I am beyond excited to have her as a guest. I know you want to hear her, and she has lots to share today. Señoras y señores, Miss Yuyi Morales. 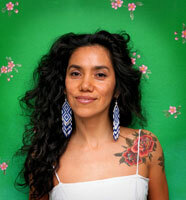 Since having immigrated to the USA in 1994, Yuyi Morales has create some of the most celebrated Latino works for children’s books.She is the multiple winner of Pura Belpre Medal for Illustration, given to a Latino illustrator whose work best portrays, affirms, and celebrates the Latino cultural experience in an outstanding work of literature for children. Welcome to our first interview for the 2013 November Mini-Interviews. I’m starting by introducing you to the work of the Spanish author-illustrator, Marta Altés. Marta has a fun, loose style. I found her work online a year ago and immediately loved it. So when it came time to short list our guests for this year, she was one of the names on my list. Now, she’s here with you and me. With you the author-illustrator, Marta Altés. The 2013 Mini-Interviews are back with more interviews, more guests, and more weeks! 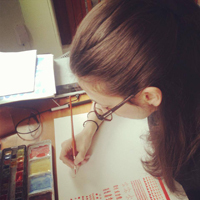 Our focus for 2013: Author-Illustrators! For this year, we have 20 Picture Book Authors-Illustrators visiting our blogs. Once again, we will be hosting the Mini-Interviews on our blogs with our regular posting schedule: my blog on Tuesdays, Molly Idle‘s blog on Wednesdays, Mikela Prevost‘s blog on Thursdays and Laura Jacobsen‘s blog on Fridays. Mini-Interviews will go for 5 weeks from November 4th through December 6th.